1Universidade Federal de Santa Maria, Centro de Ciências Rurais, Programa de Pós-Graduação em Ciência do Solo, Avenida Roraima, 1000, C.P. 221, CEP 97105-900, Santa Maria, RS, Brazil. *Corresponding author: brunetto.gustavo@gmail.com. 2Empresa de Pesquisa Agropecuária e Extensão Rural de Santa Catarina (EPAGRI), Rua João Araújo Lima, 102, Bairro Jardim Caiçara, CEP 88600-000, São Joaquim, SC, Brazil. 3Embrapa Uva e Vinho, Rua Livramento, nº 515 Caixa Postal: 130 CEP: 95700-000 - Bento Gonçalves  RS, Brazil. 4Instituto Nacional de Investigação Agrária e Veterinária, Quinta do Marquês, Av. República, Nova Oeiras, 2784-505 Oeiras, Portugal. The presence of cover crops in vineyards may decrease the availability of nitrogen (N) derived from fertilizer to grapevines. The present study aimed to evaluate the recovery of urea-15N and growth of young grapevines with and without natural vegetation in plant rows. The study was conducted in southern Brazil on one-year-old Chardonnay grapevines grown in soils with and without cover crops. The grapevines were subjected to the application of 40 kg N ha-1 in the form of urea-15N at 3% 15N atom excess. Dry matter yield, total N and fertilizer N were assessed in grapevines and soil layers. A small amount of N that is applied during the growing season of the grapevines is readily assimilated by the plants. The maintenance of cover crops in young vineyards may favor the maintenance of higher levels of N in the subsurface layers of the soil, contributing to the nutrition of the grapevines in the following growth cycles. The presence of cover crops reduced the importance of nitrogen fertilization in the growth cycle of grapevines because a large part of N absorbed by grapevines was derived from other sources. Nitrogen derived from the fertilizer applied to the soil in the presence or absence of cover crops was mainly concentrated in the newly-formed vegetative grapevine organs (leaves and shoots). The presence of spontaneous or implanted cover crops in vineyards may contribute to the increase of soil organic matter, soil aggregate stability and soil microbial activity, when managed by mowing. Growing plants and residues deposited on the soil surface contribute to the dissipation of kinetic energy of raindrops and the reduction of soil particle breakdown by water erosion, also promoting nutrient release in soil (Brunetto et al., 2011; Brunetto et al., 2014; Rumpel et al., 2015). Cover crops in the grapevine planting rows are sometimes desiccated with post-emergent herbicides (Giese et al., 2014) to avoid their competition for water and nutrients, especially N, compromising the proper growth of grapevines, especially that of young plants. Permanent cover cropping is currently increasing in vineyards worldwide because of its beneficial effects to soil and grapevine health, but studies evaluating their competitive effects on grapevines have been conducted primarily in non-irrigated vineyards. Urea has been used as a mineral nitrogen (N) fertilizer in vineyards. This N fertilizer is rapidly hydrolyzed in the soil by the extracellular enzyme urease produced by microorganisms such as soil fungi, bacteria and actinomycetes. Formed ammonium carbonate (NH4+)2CO3 is not stable in the soil and is decomposed into bicarbonate anion (HCO3-), hydroxide ion (OH-) and ammonium (NH4+-N) in the presence of soil water. HCO3- is also decomposed into carbon dioxide (CO2) and OH-. The loss of ammonia (NH3) to the atmosphere may occur with the reaction of NH4+-N with OH-, especially when the soil pH is not higher than 8 (Singh et al., 2013), but part of the NH4+-N is simultaneously converted into nitrite (NO2--N) and nitrate (NO3--N) through biological oxidation (Ladan and Jacinthe, 2017). NO3--N in the soil is rapidly absorbed by cover crops, thus decreasing its concentration in the soil and the amount available for grapevine uptake (Pérez-Álvarez et al., 2015). If this happens, less transport and accumulation of N in annual organs of grapevines is expected (Glad et al., 1994). With the elimination of cover crops in the planting rows of young grapevines by desiccation, a higher concentration of NO3-N derived from urea is expected in soil, thus promoting greater N recovery by young plants. However, when NO3--N is not absorbed by the grapevines, it may be lost by leaching, especially in soils with sandy texture, in particular when associated with a high volume of rainfall (Brunetto et al., 2006a, b; Barlow et al., 2009; Lorensini et al., 2012). The 15N isotope has been used as a tracer in studies of plant N recovery and accumulation in plant organs (Menino et al., 2007; Neto et al., 2008; Brunetto et al., 2014), because it enables an accurate tracking of the amount of fertilizer N absorbed and its fractionation in plant organs. Intercropping vineyards with cover crops has been used but information on its potential competition is scarce. The present study aimed to evaluate the recovery of N derived from urea-15N applied to the soil by young grapevines, in the presence or absence of cover crops in the planting rows under irrigation system. The experiment was conducted from July 2011 to July 2012 in a vineyard located in the city of Santana do Livramento, located in the Campanha Gaúcha region of the state of Rio Grande do Sul, southern Brazil (Latitude 30° 49'7.82"S; longitude 55° 27'2.65"W). The climate is humid subtropical (Cfa) according to Köppen classification (Köppen and Geiger, 1928). The annual temperature varied from 11.9 to 23.5 °C and the annual rainfall was 1599 mm. Data of temperature, rainfall and insolation measured during the experimental period are presented in Table 1. Table 1. 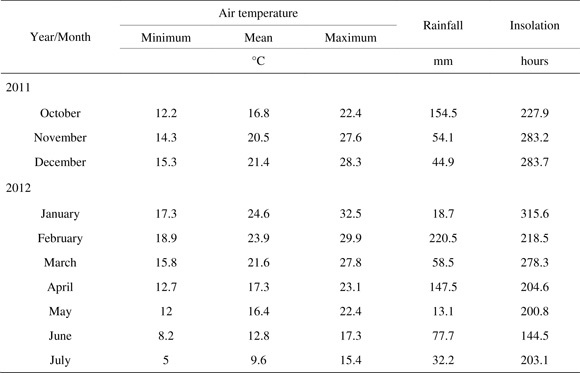 Air temperature, accumulated rainfall and average insolation during the experimental period in Santana do Livramento, state of Rio Grande do Sul, Brazil. The soil is classified as Typic Hapludalf, according to Soil Survey Staff (2006). Main physical (Embrapa, 1997) and chemical (Tedesco et al., 1995) characteristics of the soil in the 0-20 cm layer are presented in Table 2. Table 2. 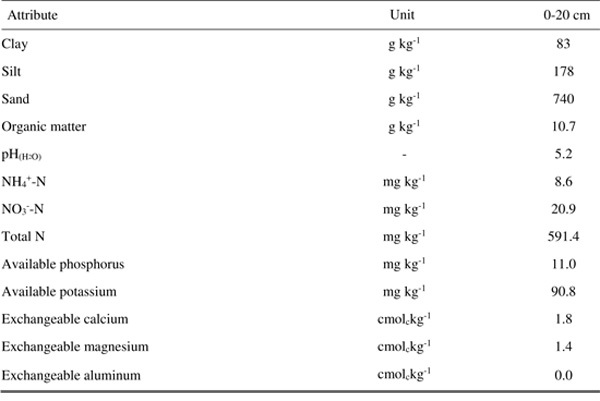 Main physical and chemical characteristics of the soil in the experimental site at 0-20 cm. The experiment was conducted in a non-anthropic, natural grassland field, without any cultivation history. The preparation of the area for the experiment started in the first half of July 2011, when we applied 3800 kg ha-1 of lime to raise the soil pH(H2O) to 6.0 and 60 kg P2O5 ha-1 as triple superphosphate to raise the available soil phosphorus (P). Potassium (K) was not applied because soil available K was high (CQFS-RS/SC 2004). Lime and fertilizer P were incorporated into the soil by plowing at a 20 cm depth using a disc plow, followed by harrowing. In the second half of July 2011, pits were open in rows and the Chardonnay grapevines (Vitis vinifera L.) were transplanted and grafted onto rootstock 110R at a density of 4000 plants per hectare (1.0 m between plants in the row and 2.5 m inter-row spacing). The vineyard conduction system was espalier. In the first half of October 2011, the treatments were defined as follows: 1) grapevines were planted in rows with natural intercropping residues, and 2) grapevines were planted under herbicide application (cover crops were eradicated by desiccation using glyphosate, a non-residual systemic herbicide, and residues were removed from the soil surface). In the desiccation treatment, the herbicide was applied twice during the experimental period, at a distance of 50 cm from each side of grapevines, using 3 L ha-1 of glyphosate in a total volume of 200 L of water ha-1. The cover crop species that predominated as natural vegetation in the grapevine rows were a mixture of grasses and Fabaceae plants: Paspalum notatun, Lolium multiflorum,Bromus auleticus,Desmodium spp. and Vicia sativa. Mowing was done throughout the whole experimental area to keep the vegetation at a 10 cm height, and residues were left on the soil surface. The experimental design was randomized blocks with three replications. Each replication consisted of five plants and the 3 central plants were evaluated. In the second half of October 2011, 40 kg N ha-1 (regional recommendation for young grapevines in soils with less than 2.5% organic matter content - CQFS-RS/SC, 2004) was applied in the urea-15N form (44% N) at 3% 15N atom excess, corresponding to 10 g N plant-1. Urea was applied on the soil surface, without incorporation, at a distance of 50 cm from the grapevines. After the distribution of urea, irrigation was provided at a rate of 14.5 mm of water. Young shoots and leaves (limbo and petiole) were collected in December 2011 (two months after N application) and in March 2012 (five months after N application), respectively, in the central grapevines in each replication and for both treatments. In July 2012, grapevines in all plots were cut close to the soil surface and separated into leaves, shoots and trunk. Grapevine roots were manually collected in a trench of 1.0 x 1.0 x 0.6 m (length, width and depth). In the cover crop treatment, cover crops were also cut close to the soil surface (10 cm height) and separated manually into leaves and shoots. The separation of grapevine roots from the cover crop roots was also done manually. All roots were washed in running water and then in distilled water. All grapevine and cover crop material was washed and dried in an oven with forced-air circulation (MA 035/1, Marconi, Piracicaba, BR) at 65 °C until constant weight. Then, plant organs were ground and reserved for analysis. The soil samples were collected at 0-5, 5-10, 10-20, 20-30, 30-40, 40-50 and 50-60 cm layers, with three subsamples per repetition. Soil samples were air dried, ground using an agate mortar, sieved (< 0.5 mm) to remove rock fragments and reserved for analysis. Samples of plant tissue and soil were analyzed for N concentration and 15N enrichment by dry combustion and mass spectrometry (20/20 Hydra model, PDZ Europa, Crewe, UK), respectively. where 0.3663% is the 15N natural abundance in the atmosphere. The data was subjected to analysis of variance, and when this analysis indicated statistically significant treatment effects, it was subjected to the Scott-Knott’s means comparison test (p < 0.05) (Ferreira 2011). 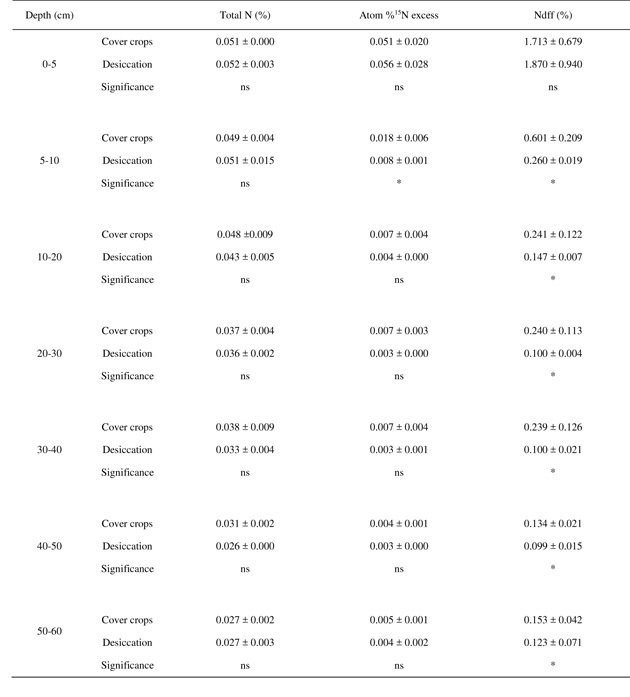 The highest dry matter (DM) yield and total N accumulated in sampled shoots (mg plant-1) was observed in grapevines grown in the soil with crop residues (Table 3). However, the highest atom % 15N excess and %Ndff were observed in shoots of grapevines planted in soil without plant residues (desiccated plants). Table 3. Dry matter, total N, atom% 15N excess and N derived from fertilizer (Ndff) in Chardonnay grapevine shoots and leaves sampled in December 2011 (two months after N application) and March 2012 (five months after N application), respectively. ns, * = F-values non-significant (p>0.05) and significant (p<0.05), respectively; mean ± standard errors; nd = not determined. 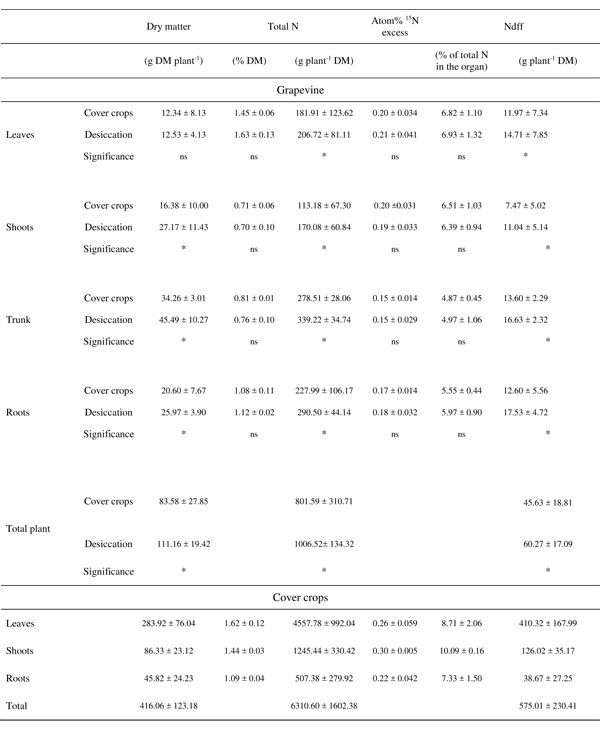 Five months after N application (March 2012), the percentage of total N, atom 15N excess and Ndff in the grapevines leaves did not show significant differences between treatments (Table 3). Comparing the 15N enrichment in grapevines planted in both treatments, it was much higher in leaves than shoots. Results obtained in July 2012, nine months after N application showed a different response to treatments (Table 4). We observed significant reduction in the DM yield of sampled grapevine organs (except leaves) and their fertilizer N recovery (Table 4). The amount of Ndff (g plant-1 DM) in grapevine shoots, trunk and roots in covered rows was reduced by 24%, 36% and 38%, respectively, which is significantly lower than the accumulated Ndff in grapevines grown in the desiccated area. At this growth phase, leaves and shoots of grapevines grown with and without cover crops had higher percentages of atom 15N excess and Ndff in relation to the trunk and roots (Table 4). Table 4. Dry matter, total N, atom % 15N excess and N derived from fertilizer (Ndff) in Chardonnay grapevine organs sampled in July 2012, nine months after transplanting. ns, * = F values non-significant (p>0.05) and significant (p<0.05), respectively; mean ± standard errors. Grapevines showed %Ndff lower than 7.0% in each organ, either in the presence or absence of cover crops in the planting rows, indicating that more than 93% of N in each plant organ was derived from sources other than the fertilizer N applied in the season (Table 4). The highest atom %15N excess and %Ndff in soil with and without cover crops was observed in the uppermost soil layer (depth of 0-5 cm) compared with deeper layers, and the values did not vary with the treatments (Table 5). From 5-10 cm to deeper soil layers, the %Ndff decreased for both treatments, but was significantly higher in the presence of natural vegetation. Table 5. Total N, atom% 15N excess and N derived from fertilizer (%Ndff) in the soil at different depths, under cover crops or desiccation with herbicide application. ns, * = F-values non-significant (p > 0.05) and significant (p < 0.05), respectively; mean ± standard error. The highest dry matter yield and N accumulation in grapevines grown in the soil with crop residues proves that for early grapevine growth, i.e., five months after transplanting (December 2011), the presence of cover crops is a positive strategy for grapevine growth. Cover crops contributed to increase nutrient availability by the exudation of organic compounds to the rhizosphere (Zuo and Zhang 2008) which was apparently used by associated perennial crop. The highest atom% 15N excess and %Ndff percentages in shoots of grapevines grown in soil without residues are attributed to the lower growth of these grapevines compared with plants in covered rows, where a higher dilution effect of 15N concentration in plants may have occurred. However, an absence of competition for mineral 15N fertilizer in desiccated rows may also have contributed to the highest 15N concentration in grapevines planted in the absence of cover crops. The percentage of all N forms evaluated in the grapevines leaves did not show significant differences between treatments, which indicates that leaf sampling at this phase is not a good indicator for differentiating between N sources in young grapevines. The 15N enrichment was higher in leaves than in shoots, meaning that leaves acted as a more efficient N darin for the fertilizer N applied in the season. As there was no change in leaf 15N enrichment between treatments in the first 5 months, this means that desiccation is not necessary during this period and vegetation may grow naturally. In addition to not affecting the uptake of N by grapevines, cover crops contribute to soil conservation by dissipating the kinetic energy of raindrops in the soil, reducing runoff (Cardoso et al., 2013; Abrantes et al., 2015). The reduction in the DM yield of grapevines, fertilizer N recovery, and amount of Ndff in the treatment with covered rows could be due to the competition with cover crops. A similar result was observed by Celette et al. (2009) who found that the presence of an intercrop (grass) significantly reduced N accumulation in shoots of grapevine during the year due to the competition for soil water and N. This reduction varied markedly between years (Celette et al., 2009) but it was more pronounced during dry years. Intercrop reduced grapevine growth of the year but also the potential growth for the following year by decreasing nitrogen perennial reserves. The higher percentages of atom 15N excess and Ndff in leaves and shoots of grapevines could be due to the N mobilization to the meristhematic plant organs, followed by rapid cell division (Conradie 1990; Brunetto et al., 2006a, b). Thus, leaves and shoots act as N drain during the vegetative growth of young grapevines (Zapata et al., 2004), as observed by Menino et al. (2007) and Neto et al. (2008), both in Portugal, for young non-bearing orange trees (Citrus sinensis L.) and deciduous fruit trees (Pyrus communis L), respectively. Values of %Ndff in grapevines were about half the amount of those observed by Menino et al. (2007) for 1-year-old orange trees in clean rows of cover crops, but were higher than measurements taken by Neto et al. (2008) for 1 to 3-year-old pear trees grown in rows with natural cover crops. Besides the probable competition among plant species, the small root development of perennial plants and their low capacity for water and nutrient uptake also explain the low 15N recovery by plants. In this study, fertilizer N recovered by cover crops (26.13% Ndff) was slightly higher than the estimated for grapevines (Table 4), showing the competition by natural cover crops for mineral N fertilizer. Low recovery of mineral N applied to the soil, especially in high doses was also observed by Lobos Ortega et al. (2016) in pasture of southern Chile. The highest atom %15N excess and %Ndff in topsoil layers in both treatments, as well as higher concentration in the deeper layers with presence of natural vegetation could be explained by the organic 15N compounds exuded by grapevine and cover crop roots, the decomposition of senescent labeled roots, or by a small amount of urea-15N leached down the soil profile favored by the light texture (Lorensini et al., 2012). However, the total amount of 15N recovered in the soil profile was low for both treatments. The seasonal response of grapevine to mineral N depended on plant age. Recently transplanted grapevines exhibited a higher dry matter yield when grown associated with natural vegetation in planting rows, whereas grapevines grown with desiccated cover crops showed lower dry matter yield, but had a higher 15N concentration in shoots. Older grapevines (12 months old in the second collection) did not show a significant difference in %Ndff when planted in rows with or without with vegetation, although the total dry matter yield was higher under cover crop desiccation, perhaps due to a probable lower competition for soil water and nutrients. Nitrogen derived from the fertilizer applied to the soil in the presence or absence of cover crops was mainly concentrated in the newly-formed vegetative grapevine organs (leaves and shoots), but most N in all plant organs was derived from sources other than the fertilizer N applied in the season. The authors declare no financial or other competing conflicts of interest. We would like to thank the Coordenação de Aperfeiçoamento de Pessoal de Nível Superior (Coordination for the Improvement of Higher Education Personnel)CAPES (Edital 034/2007) for the scholarships and other financial resources and the Conselho Nacional de Desenvolvimento Científico e Tecnológico (Brazilian National Council for Scientific and Technological Development)CNPq for granting scholarships to the first and third authors.